For today's review, I submit live commentary from our esteemed Colum Amory as he solves the puzzle in person across the table from me. It's as faithful a recording as I could make because I can't type as fast as he can solve. 1D, I entered AXEL. I think I've got 1D wrong already. Unlikely that a TV Series title starts with an X. It might be LUTZ. I want 1A to end with LAB. 7D - I want it to be stayedin but it won't fit. Prime minister between Barak and Olmert was SHARON. Impolite sound might be a snort. Base 10 = LOGARITHM. So, not snort. Must be SLURP. "Real name of Green Hornet. Don't know it. What you're solving informally (24A) XWORD. Person known as the Jezebel of Jazz. Lovely epithet but I don't know who that is. Longest song on Dark Side of the Moon, not Time and not Money. Don't know it. 36D is Next GEN. 39A Tough is THUG. Atmosphere is AURA. It must be ANITA, but ANITA who? Question after an interruption. WHERE/WASI. USANDTHEM is the name of the of the song. So the source of the whirlwind quote is HOSEA. Jesus (interjected by Frannie). 14D Slams. I don't know. I put the S in. Why not? I'm stuck over there so I'm moving to another area. I think it's a hidden capital. Lab wear must be SMOCK (I love that word - Frannie). Warner BROS - we do not like that. Many a B school applicant. ECONMAJOR. CA's wife helped out with that one. Like snow en Argentina. I want it to be rare, but that's not right. It must be a Spanish word. CLIMBS for Shins. I like that actually (I don't, says Frannie). Klondike product. Something TACO. 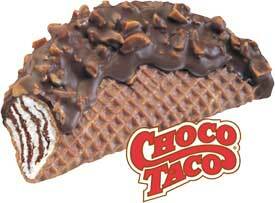 Oh yes, CHOCOTACO. Idol group: MOB. TYRABANKS must be the one who popularized smizing. What does that even mean? No one knows. Oh, snow en Argentina is BLANCA. IC door . Oooh, magICDOOR. Fires (up). Don't know. I'll put the S in. I think MRS. Woodrow Wilson is EDITH. So, it is PEPS. Maybe. Browsers aids. CACHES. Weird. It does aid you according to Horace. Quickens things up. AMOCO must be Exxon competitor. So it's DODO for Dum dum. I don't like it. Nero, by all accounts. Aggh. I'm stuck again. DNF suggests HF. Like a paperclip. I want to say BENT. Maybe it is. Maybe it's BOZO instead of DODO. ATTICDOOR. OK. Knock over is AMAZE. Oh EGOMANIAC for Nero. See ya is PEACE. I like that a lot. SACHS I've never hear of him. Goldman Sachs? suggests HF. Colum's wife helped with SUMOMATCH. ATEST not again. I hate that. MAGUS. You dropped that right in? Well I had the US. ANITA I still don't know who it is. ODAY. Ate in. ATEATHOME. China arrangement TEASET. I liked that one. They're not generic: NAMEBRANDS. That one is quietly nice. I'm stuck in this top right corner. Over. It's not agape. Oh. AGAIN. And PANS for slams. That makes sense. Symbol of the National Audubon Society is EGRET, right? Abandon plans in modern slang. Bail? I don't know. Wizard of Oz farm hand might be Pete. Might be Gene. Maybe EGRETS wrong. I'm going to take EGRET out. Place where analysis is done. Therapy? Half an 1990 telecom merger. Might by NYNEX. That would be something. Oh, it's UGLYBETTY. It is EGRET. LEFTBRAIN. It is LUTZ of all things. TRAPQUEEN never heard of it. 17:12. LEFTBRAIN, I'm happy with that, although it's probably not actually true. NAMEBRANDS is very good. TEASET I liked a lot. A Fetty Wap # 2 hit from 2015 is pretty far out there for knowledge expectation. The puzzle is Scrabble-y(tm) - a bunch of x's and z's and a j. BAJAN is my least favorite. ELECT (Give a seat) was excellent. OVER is a tough one. Above and ended both fit, but are not right. HOSEA and REID are both tough. Some liked Pit-y party (BBQ) and some didn't. All agreed on not liking REUNES. Wow, fast solve, Frannie. I actually had the bulk of the puzzle done very quickly, in around 15 or so. However, the NW took the remaining 9+ minutes. ZEKE saved me from axel, which I'd entered first, but the rest, quite slow indeed. I got TYPEA right away, which steered me away from some type of therapy at 1A. REUNES and ATEATHOME also went right in, but the crosses were bears, especially TRAPQUEEN, as Frannie notes, which is completely unknown to me, as is the person named in the clue. UGLYBETTY isn't on my radar, and I wanted plAtEs where TEASET goes, so it ran me almost 25 minutes total in the end. But no errors and a good, solid solve, so nice Saturday. Frannie was reporting Colum's time. She was typing non-stop as Colum solved. Really quite interesting to see.